Sunshine to start, then a few afternoon clouds. High 73F. Winds SSW at 10 to 20 mph.. Partly cloudy skies early will give way to cloudy skies late. A stray shower or thunderstorm is possible. Low 51F. Winds SSE at 5 to 10 mph. 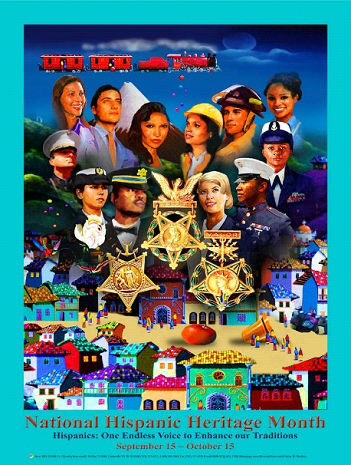 A proud heritage, a propensity towards service built on tradition and culture is depicted in this beautiful image ‘One Endless Voice to Enhance Our Traditions’ poster celebrating National Hispanic Month September 15th – October 15th, 2018. One endless voice in harmony, oftentimes in two languages, always enhancing our traditions. I’m about to give you the 411 on this perplexing dilemma. What is the difference between Hispanic and Latino. Citing some of the work by Terry Blas a writer/cartoonist and creator of the web series Briar Hollow I’m about to help simplify the answer. “Latino is a term that tells us about geography. Hispanic is a term that tells us about language.” Okay this is where it can get a bit confusing. Blas continues to say “Latino refers to someone coming from Latin America which includes mostly every country below the USA including the Caribbean. Hispanic means coming from a country whose primary language is Spanish.” There’s a catch, though, not every country in Latin America has Spanish as the main language. Wait, there’s more. Joining the illusive Hispanic vs Latino conversation is LatinX a new term that is gaining momentum in the discussion. According to http://remezcla.com “…the term LatinX – which has existed online since at least 2004 – arose as a gender-neutral alternative to Latino and Latina. However, some believe that Latino already effectively groups a large number of men and women with Latin American origins and that substituting the O for the X unnecessarily complicates the language.” Proof of the fluidity of diverse terms to describe this growing population. Further proof of the power of the millenniums who know what they want. No matter the term used. No matter the language. The 2018 National Hispanic Heritage Month poster ‘One Endless Voice to Enhance our Traditions’ says it all. Pride and hope for the future in the eyes of the diverse community of Latino/a’s, Hispanics, LatinX generations of exceptional role models. The contributions in the armed forces, civil service, entertainment and the arts, medical, judicial, sports world, science, anthropology to name a few, is a historical noteworthy section for our nation’s history books. A special ‘gracias’ to the folks at diversitystore.com for allowing us to share their beautiful artwork with our Insight News-McFarlane Media family. With a variety of products for over seventeen special observation themes, including Black History Month diversitystore.com is the place to go for quality items portraying honor in all themes. Go to www.diversitystore.com or call 1-800-200-5964 for information.